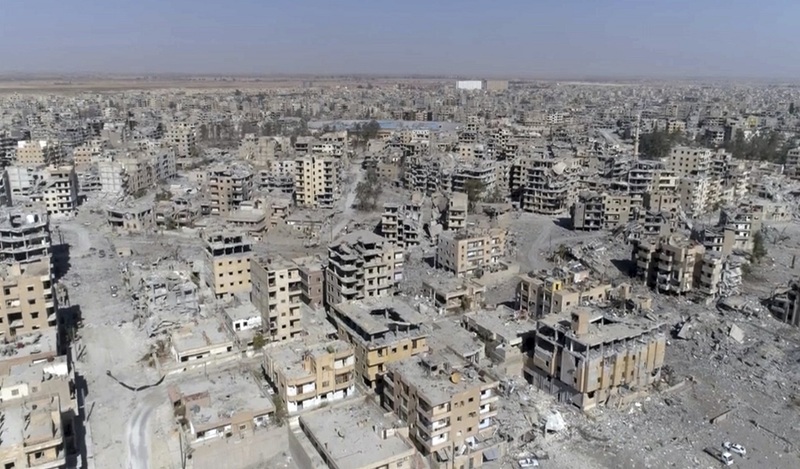 This Thursday, Oct. 19, 2017 frame grab made from drone video shows damaged buildings in Raqqa, Syria two days after Syrian Democratic Forces said that military operations to oust the Islamic State group have ended and that their fighters have taken full control of the city. He says the coalition efforts has seen Islamic State's "so-called caliphate crumble across Iraq and Syria" but cautions that "our work is far from over." Tillerson says the "liberation of Raqqa is a critical milestone in the global fight ... to defeat these terrorists." He says the fall of the city that was IS' de facto capital also "marks the beginning of a new phase in the Syrian conflict" in which the United States and its partners will seek to "de-escalate violence across Syria." He says: "We are confident that we will prevail and defeat this brutal terrorist organization." The U.S.-led coalition says the Islamic State group's loss of the Mosul and Raqqa are "turning points" for the extremist group, but adds a "tough fight" still lies ahead to eradicate IS remnants in Iraq and Syria. In a statement released Friday, it congratulated its Syrian partners, the Kurdish-led Syrian Democratic Forces, for conducting "a highly effective, professional operation in a difficult urban area." "Raqqawis now have a chance to control their own future," it said. Turkey's president has criticized Western nations, mainly the United States, over their support for Syrian Kurdish fighters in the wake of the liberation of the Syrian city of Raqqa from the Islamic State group. Amid the celebrations, the Syrian Kurdish fighters have hung up posters of Abdullah Ocalan_the leader of the outlawed Kurdistan Workers' Party, or PKK, imprisoned in Turkey. Erdogan said: "They (Syrian Kurds) hung a poster of the terrorist in Raqqa. How is America going to explain this?" The Turkish leader also accused the U.S. and European Union nations of publicly calling the "PKK a terror organization" but allegedly protecting the group. Iran's army chief of staff and other senior officers from the Iranian military have visited a front line in the northern province of Aleppo saying that the extremists' presence in Syria is coming to an end. Iran has been one of Syrian President Bashar Assad's strongest supporters since the country's crisis began more than six years ago and has sent thousands of Iranian-backed militiamen to boost his troops against opponents. The government-controlled Syrian Central Military Media on Friday quoted Maj. Gen. Mohammad Bagheri as expressing happiness "to witnesses the success of the axis of resistance." He was referring to a coalition of Iran, Syria, Iraq and Iran-backed groups in the region. A U.S.-backed Syrian force has declared victory over the Islamic State group in its former "capital" of Raqqa, declaring the city free of any extremist presence. 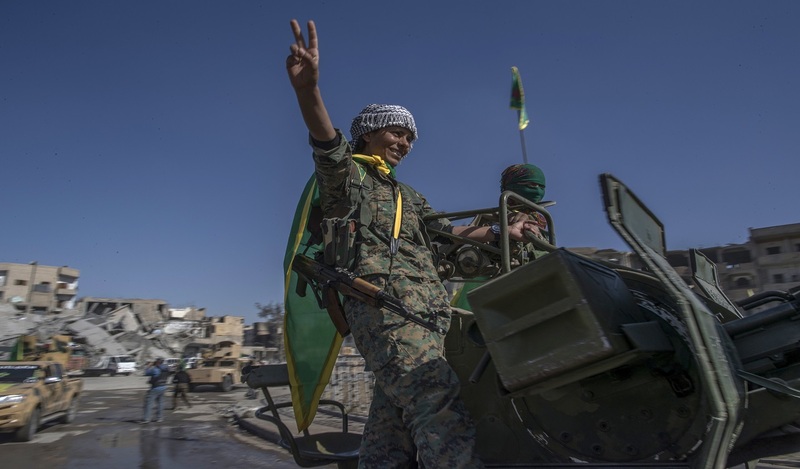 "Our victory is one against terrorism," said Talal Sillo, a spokesman and senior SDF commander. The press conference was held inside the city's sports stadium which Islamic State militants had turned into a huge prison where they incarcerated and tortured their opponents. Russia's military says a recent travel warning by the U.S. State Department proves Moscow's argument that Syrian militants — and not the Syrian government — have used chemical weapons. The Russian Defense Ministry said in a statement on Friday that the travel warning proves Moscow's point that the extremists, not the Syrian government, are to blame for a deadly chemical weapons attack in a town in Syria's east.